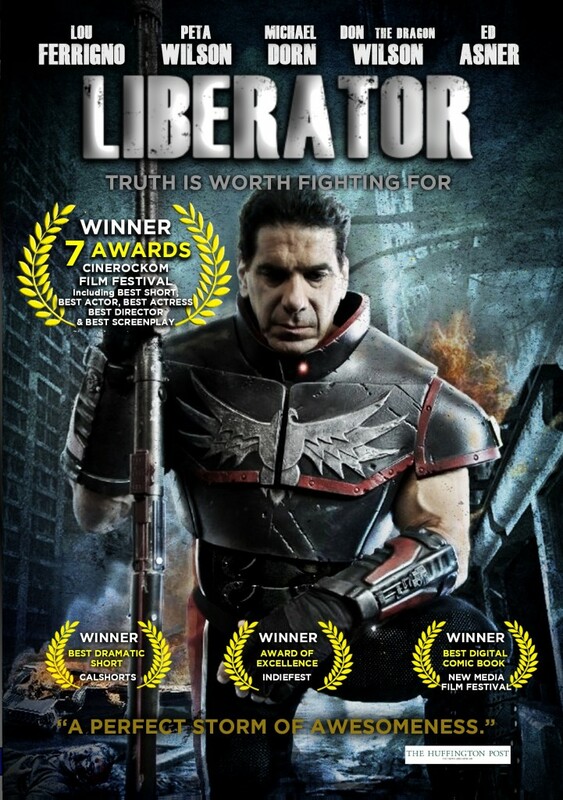 The buzz over Lou Ferrigno's award-winning superhero short film LIBERATOR (www.liberatormovie.com), which continues to pack houses at film festivals and comic conventions, and has won two Best Picture awards along the way, has skyrocketed with news of Bluewater Comics' launch of the "Liberator" comic book series. The film, which not only stars Ferrigno, but also Peta Wilson ("La Femme Nikita"), Michael Dorn ("Star Trek: The Next Generation"), kickboxing legend Don “The Dragon” Wilson, and Ed Asner (UP), will take on new life in the comic, written by LIBERATOR co-creators Jim Cirile (Writer/Executive Producer) and Aaron Pope (Writer/Director), with art by acclaimed graphic novel artist Gerry Kissell ("Code Name: Geronimo"). The special edition 2-issue comic series continues and expands the story from the short film and will feature likenesses of the actors, making the comics a must-have for genre fans. The story features Ferrigno as the world’s first superhero whistleblower, whose allegations against his former employers – the US government – put him squarely in the cross-hairs. With echoes of Bradley Manning and Edward Snowden, the story has a ripped from the headlines feel and pulls no punches. LIBERATOR brings up some important questions within the context of an action-packed superhero yarn. Ferrigno is ecstatic about the disgraced but reinvigorated hero continuing on in further adventures, saying, "The rejection, the vulnerability, the anxiety -- these are all the elements of why I think (Liberator is) an interesting character and in a way the ultimate superhero. This movie has a message. You can walk away feeling like you've learned something from the film, which some films today don't have. I'm excited to see this character continue and to see where the story goes in the future." The comic has already won Best Digital Comic from New Media Film Festival, even before publication. According to the film's director and co-writer of the comic series, Aaron Pope, "This story is really the maturation of the comic book hero, the tale of a man who isn't just a physically powerful specimen, but is actually a man, a father, a real human being dealing with all the faults and failings that we all deal with in real life. And it's out of those troubles that Liberator finds his inner strength to stand up and fight for the truth." The next scheduled screenings of LIBERATOR will be at Wizard World Comic-Con in Chicago in August. There’s a new superhero in town -- and chances are, you’ll like him when he’s angry. LIBERATOR, an 18-minute short film/presentation pilot, stars “The Incredible Hulk” star Lou Ferrigno, returning to superheroics to play an aging, disgraced ex-superhero turned whistleblower. After a successful festival/Comic-Con run followed by six months on iTunes and Amazon streaming, LIBERATOR is now available for the world to see in HD courtesy of YouTube. Says Director Aaron Pope (My HAUNTED HOUSE), "I'm really so thrilled that LIBERATOR is now going to be available free, worldwide. Our tagline is 'truth is worth fighting for,' and never has that statement been more true than right now. If putting our movie out there now helps anyone anywhere realize the value in fighting for what's right, it's well worth it. And hey, if people just want to enjoy a bit of superhero fun at the same time, they can do that too."